This Gospel of John has a cover designed to appeal to motorcyclists ministering to the Harley Davidson crowd. Many of our members have told us they are involved in motorcycle ministries so this Gospel of John cover is our response to this need. Features modern graphic design throughout with oversized chapter numbers to enhance readability. 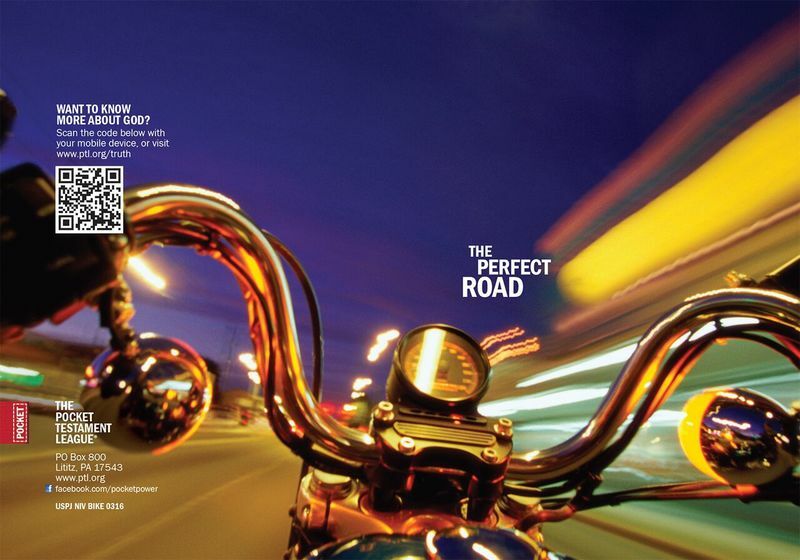 What could stir the heart of a biker more than the image of a bike shot from the driver's seat? The title, "The Perfect Road," alludes to the narrow road of faith that Jesus talked about. Shown is the front and back cover spread. Like all our Gospels, it contains a Plan of Salvation, decision page, and an opportunity to sign up for our free correspondence course. A QR code on the back cover provides quick access to more information about God.